Whenever Matt and I are traveling by canoe, we act like we are in a safari jeep. We are constantly scanning the tops of trees for bald eagles and ospreys, hoping we’ll stumble across a moose feeding in a marsh or searching for beavers around their impressive lodges. While the birds and mammals of the great north woods are far more elusive than their African counterparts, the thrill of spotting something from a canoe is every bit as enjoyable, and we had some memorable moments on this year’s trip. 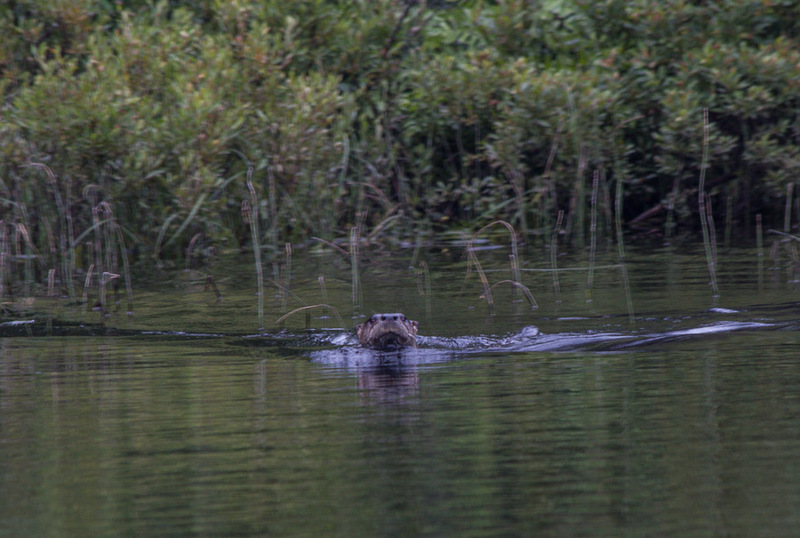 We both nearly jumped out of the seats of our canoe (not wise in a small boat with lots of camera gear) when we came across an otter on the narrow band of the Kawishiwi River between Alice and Insula Lakes. The otter must have been just as startled as we were because it made lots of loud grunts and snorts as we glided past its hiding place under the low branches of a cedar tree growing over the water. It was funny, because, if it hadn’t made such a racket, we would have never known it was there. But the strange sounds stopped us in our tracks, and we had to turn back to see who we had offended so much with our passage. The otter darted along the water’s edge, skimming the surface and keeping us abreast of his whereabouts with his tough guy act. Every now and then before going underwater, he would raise his head up above the surface and stare right at us in disbelief as if to say, “What are you two still doing here? I thought I told you to go away already!” Eventually, he managed to give us the slip, and we headed on our way. We were lucky to spot a whole family of otters the following morning as we departed from our island camp on Lake Insula. The three of them were lazing about in the water and were equally offended when we disrupted their fun. This group retreated into their den hidden in the large boulders that lined the shore of a nearby island, and we had fun listening to them cavort in the safety of their home. If you closed your eyes, you might think you were in a barnyard instead of the Boundary Waters—their snorts and oinks made them sound a lot like pigs! 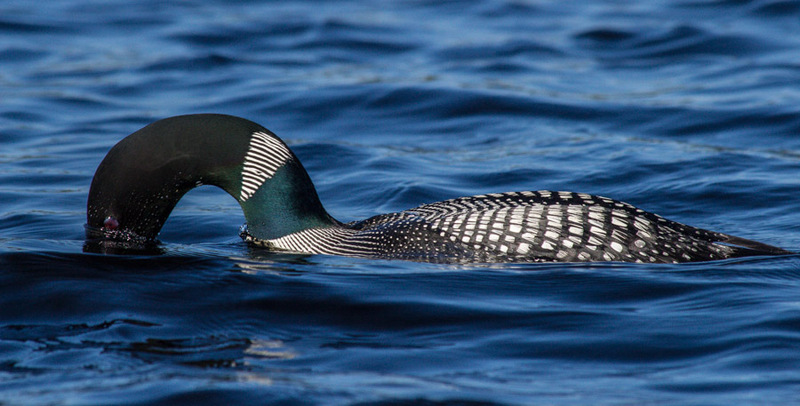 A far more common and congenial subject is the loon. It seems like every lake has a resident pair, and, if you are lucky, this beautiful bird will tolerate your presence and allow some good photo opportunities. 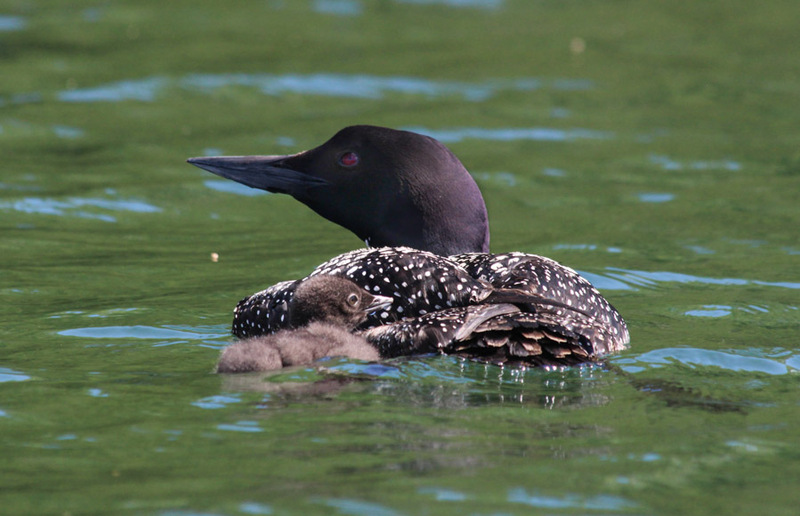 This year the loons didn’t seem quite as numerous in years past, but we did run into one pair feeding with a young chick. One parent would stay at the surface with the chick while the other would dive for fish and bring back a tasty fish for the little one. On our day trip through Beaver Lake, we also encountered a very patient loon who allowed us to travel alongside him as he fished for his lunch. We had read in a field guide that the average length of a loon dive is 42 seconds, and we were impressed at how well this loon stuck to the schedule on each of his forays underwater. We would scan the surface looking for bubbles, hoping to predict where he might pop up next. We were always a bit off, but he would oblige us for a few seconds at the surface before heading back down to his underwater buffet. If you come across a loon preening itself, it will often be so engrossed that it becomes more or less oblivious to your presence. This was the case when we came across a pair on our very last morning on Lake Two. They would alternate between feeding and cleaning, only distracted from their preening duties by the fish that seemed to be swimming just below the surface. It was fascinating to observe the loons chasing their prey underwater, and we watched in wonder as they contorted their bodies into strange positions to make sure every last feather was well-groomed. If there isn’t already a yoga pose named after this flexible bird, there should be! We could have sat and watched them all day, but this final morning commune with the loons was a peaceful and fitting end to this year’s trip to the Boundary Waters. And with that, we packed up the camera and paddled back to Lake One and civilization with the feeling of serenity that can only come from immersing ourselves in one of nature’s most peaceful places. It was hard to say goodbye, but knowing we will be back in the next summer or two made our parting less sorrowful. I love hearing the loons. If you do, you know you are in the middle of nowhere! Absolutely! Their calls are so beautiful, one of the best sounds of the Boundary Waters! Thanks, Victor. We appreciate the feedback! Really enjoyed your Boundary Waters series! (Have to catch up on a few posts.) Have you decided on your summer plans, yet? It’s not too, too far away! Thanks, Melissa. We have decided on our summer plans. We are going to do some trekking in the Indian Himalayas for several weeks and then head to Mt. Rainier in Washington state to backpack the Wonderland Trail. How about you and Shon? Any travels in the near future? Maybe you’ll want to consider the Boundary Waters on one of your trips up north? Loons and otters? What a wonderful canoe trip. Great photos to capture what you saw. I’ve so enjoyed your series on the Boundary Waters. You two should be featured in National Geographic. Your pictures are spectacular and your narrative a pleasure to consume. You’re too kind, Rick. If only National Geographic would come calling! Unfortunately, I don’t think we are quite up to their standards, but we sure do have a lot of fun trying. Thanks so much for reading! That last photo is especially magnificent. Thanks! 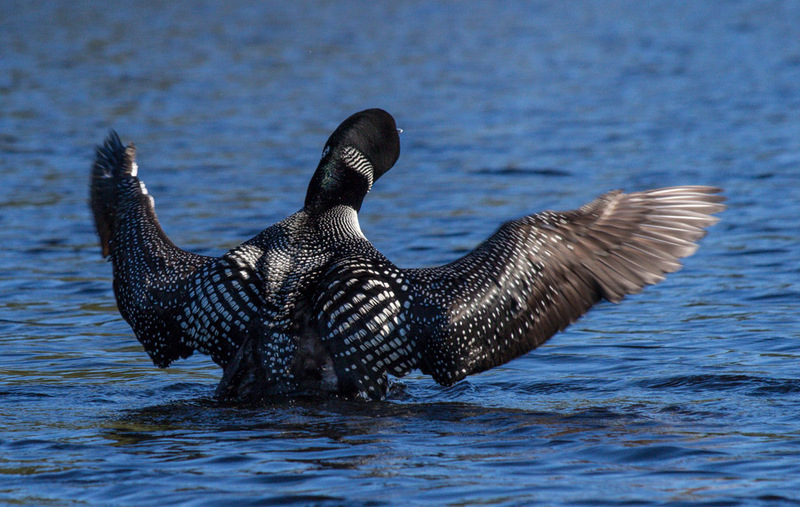 That’s a behavior you often see in preening loons, so we kept waiting patiently for him to do it. It really shows off their beautiful markings. What gorgeous birds they are. We really appreciate you visiting our blog!